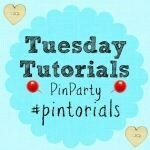 Welcome to Week 15 of the Tuesday Tutorials Pintorials Pin Party! This is my second week hosting! Hope you come and join us every week if possible! If you need a reminder, tweet me @etspeaksfrom and I will remember to tweet you every Tuesday! This week I am featuring a flower theme! I love how dabblingmomma created this beautiful flower diorama! Such a great idea! Next thanks to letkidsbekids who simply used finger tips to make creative flower cards! Last but not least, fromabcstoact created a printable pre-school maths game – flower petal counting! Such clever ideas! Have a look over at my fellow Anna’s woodland craft, Kate’s craft for summer fun and Gude’s best p craft for kids as we each feature something different and I know they have some great posts picked out. First time joining us, just like me! Simply add your posts to the linky and they will be shown across all 4 of our host blogs (Myself, ET Speaks From Home; In The Playroom; Hodge Podge Craft and Craft on Sea) and then pinned to our group board. Each week the 4 of us will showcase a selection of three posts each to feature the round up on our blog along with the next weeks’ linky. Link up one post a week – It can be a tutorial, how-to or even food recipe- old or new! Looking forward to read about your shared blog post with us this week!